The question has been popped, the venue chosen, sent save the day cards and the wedding dress hunt has begun but what about the entertainment??? Of course there will be music and dancing, maybe even a crazy first dance that will end up on Youtube, however the growing trend now is to add little something more. For many this is a photo shoot set up varying from a blank screen and a few props to outrageous Las Vegas backdrops with large inflatables on the other hand if you’re looking for something a little unique with a quaint twist to fit in with the serenity of your day and still make it memorable then why not take a look at Daisy Daisy? 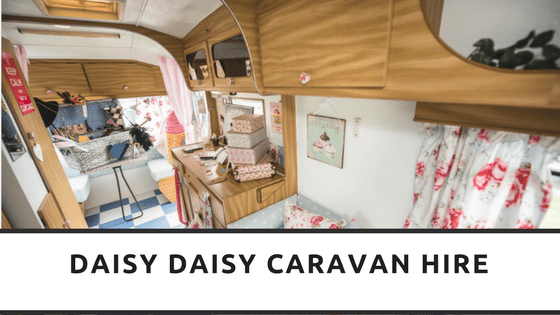 Daisy Daisy is a vintage caravan photography set up based in Ellesmere Port, Cheshire with a collection of vintage and retro props, decorative bunting and electric hook-up for the retro radio Daisy Daisy is perfect for any event. Be it a wedding, corporate or a little something different for the family get together, everything you need is included in your package tailored made to you, starting at £95 for 100 Polaroid shots and a guest book. Daisy Daisy is taking books for 2016 and filling up fast, take a gander at the website – Daisy Daisy Vintage Caravan or call them (07773 247 163) today and see how they can help make your memories more memorable.